God's grace demonstrated in the biblical narrative through the lens of covenant. This study analyses the different divine covenants of the Old Testament and argues that they are closely related. The successive covenants, from Noah to David, are seen to express the divine purpose for humanity from the creation onwards. William Dumbrell interacts extensively with attempts to explain the significance of concepts such as the gift of the land, victory, rest and the divine presence. This extraordinary book also throws light upon the Christian use of the Old Testament categories. This second, revised edition brings the subject right up to date. William J. Dumbrell (Th.D., Harvard University) was for many years Vice-Principal of Moore Theological College, Sydney where he also lectured in Old Testament. He also lectured at Regent College in Vancouver, and Trinity Theological College in Singapore. He is the author of many fine books that follow some significant biblical themes from Genesis to Revelation such as Covenant and Creation, The End of the Beginning, The Search for Order, The New Covenant and The Faith of Israel. He has also written commentaries on Galatians, Romans, and the Gospel of John in the New Covenant Commentary Series. He still teaches at several Sydney colleges and at Macquarie University, Sydney. Customer Reviews For "Covenant and Creation"
Dumbrell gives a detailed survey of the features of the Abrahamic, Mosaic, Davidic, and new covenants. He also draws some comparisons between them, thereby suggesting an overall unity across the covenants. 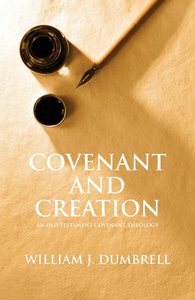 What's distinctive about Dumbrell's approach is that it traces the covenants back to the first covenant, which he calls the "covenant with creation". The individual chapters are helpful as insightful discussions of each covenant, while the overall argument is a unique contribution.